Spiritual as well as physical damage is being done by our disconnection from nature. That’s the main message of the latest edition of A Rocha UK’s magazine ‘Root & Branch’ – which lands on supporters’ doormats soon. Editor Jean Morgan warns of ‘the relentless pursuit of “progress”‘. 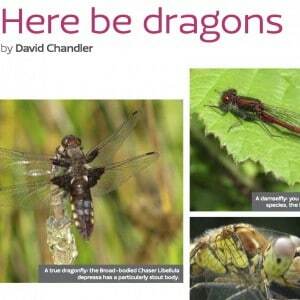 She points out, ‘That loss in the natural world causes the loss of something within ourselves as well.’ In her introduction, she unpacks the journal’s theme – and how it’s reflected in such articles as an interview with celebrated birder, author and journalist Dominic Couzens and a highly colourful spread on dragonflies. A Rocha UK’s tree bee campaign has ended. For latest practical conservation projects, please visit arocha.org.uk/our-activities/practical-conservation.